My poor neglected barbecue had little use since my wife bought it for me as a housewarming present back at the end of August. All told, I have only been able to use it a few times so far, what with being away from home so much and being cursed with crappy weather the rest of the time… I was very much hoping to do a whole host of posts featuring interesting barbecue adventures but it looks like that might have to wait until next year, I’m afraid. 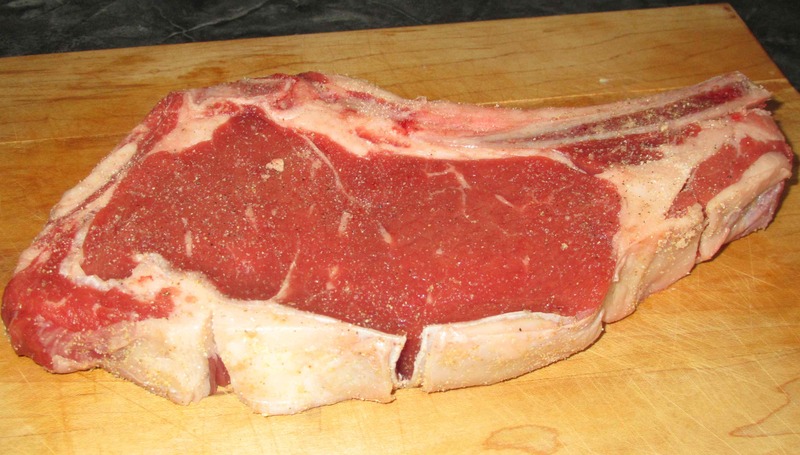 Rib-steaks are my absolute favorite cut and the one I almost always order in steakhouses. The one I purchased for this meal wasn’t too bad on the whole, decently marbled and nice and thick, but I like a heftier bone than this one had. 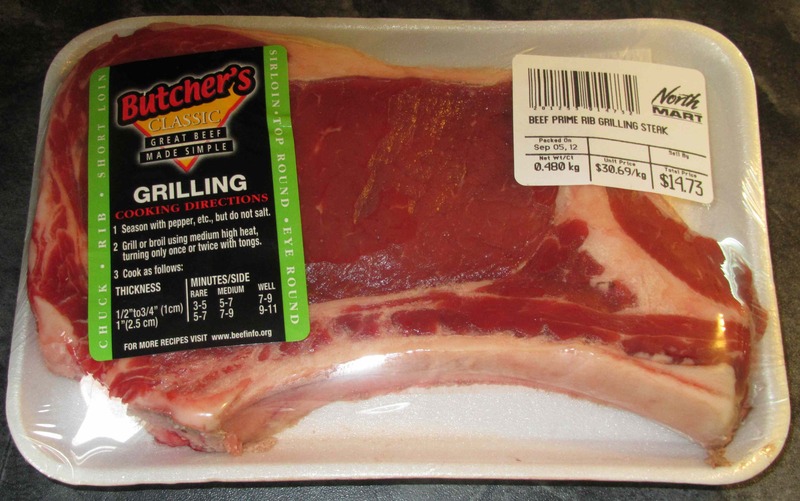 As you can see, this cut commands about $15.00 a pound in our local store, which is about average up here, but I would be curious to hear what others are paying for similar steaks. 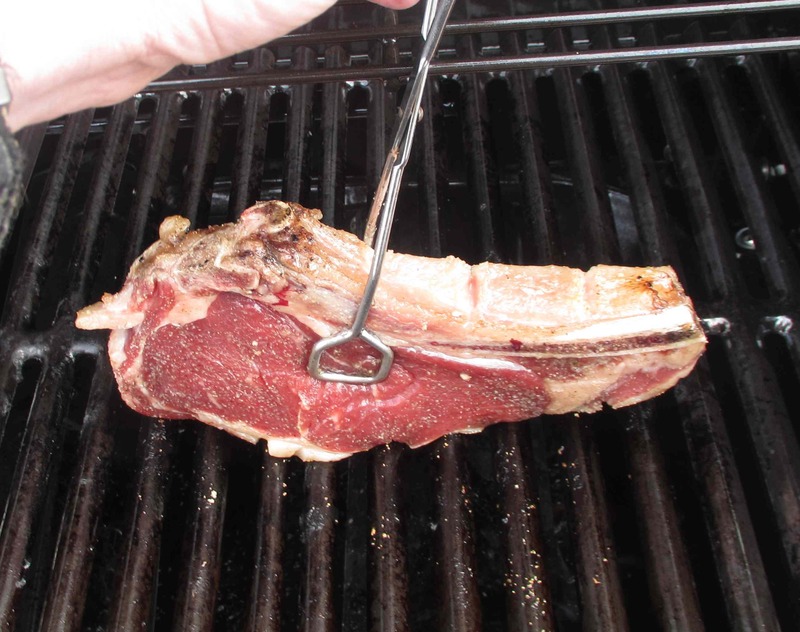 Before cooking steak, I always slash the fatty edge in a couple of places as this prevents it from curling as on the grill. I was surprised to see that the label counseled against salting while raw but I have always used salt in my pre-cooking seasoning and always achieve good results when I do. I didn’t record exactly what I used on this occasion but, if I recall correctly, it was garlic salt, black pepper and crushed celery seed. For veggies, I decided to grill some zucchini alongside the steak. I marinated the slices with olive oil, black pepper and thyme. And this was my meal… Nothing special, I suppose, but good comfort food nevertheless. Myself, I like steak cooked in the fashion known as ‘Chicago style’ in some quarters. Basically, this is where you cook the steak to just before the desired degree of ‘doneness’, and then finish it over really high heat until it gets a good char all over. Sadly, the wind across my deck was just too high to allow the right level of heat for this (as has been the case every time I have barbecued thus far), so I couldn’t get that quite right, this time… maybe some sort of wind-shield is in order for next year. 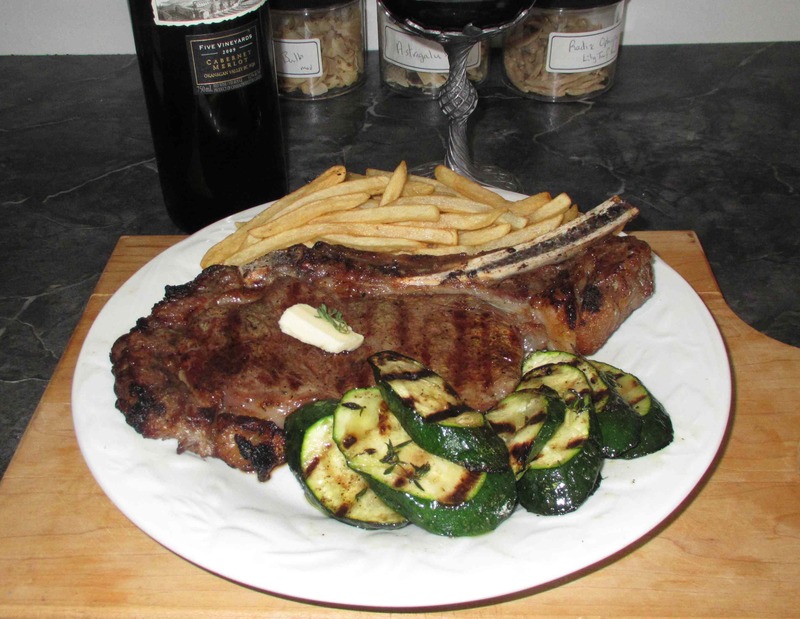 A good steak on the grill always hits the spot and I too love zucchini’s on the grill. Yumm! 😉 We are out of BBQ season now… enjoy yours! That looks very good, but WOW is beef expensive there. It’s about half that in Chicago. Point made. We do get to maybe -5, does that count? Probably not. That’s just ridiculous cold. Looks like a great meal. I love a good ribeye. That looks yummy, BBQ weather is well and truly over in England though. I had a look in Tesco, we’d pay the same price as you would for that piece of meat. 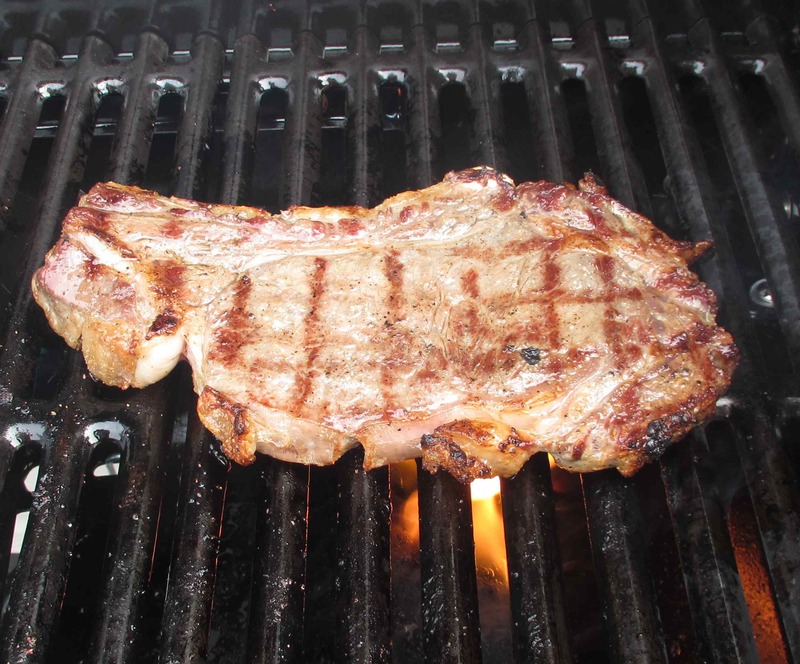 I like my steak charred on the outside and still mooing on the inside.. I see one reader commented that steak was half the price I paid where they are. That’s Chicago though and I gather that’s a major meat-packing center… BTW, the way you like your steak is referred to as ‘Chicago rare’ by some… I like mine charred too, but I like the center medium-rare rather than rare… have you ever had ‘blue rare’? I like my steak blue, providing it’s been left at room temperature prior to cooking, or you just end up with a cold steak that’s been browned a bit..
We’re paying about $6.99 lb here in Richmond, VA for ribeyes and about &.99 for NY Strip. I like the strip better myself but my hubbie is a ribeye man. I let my meat come to room temp and then rub well w/olive oil and salt and pepper. 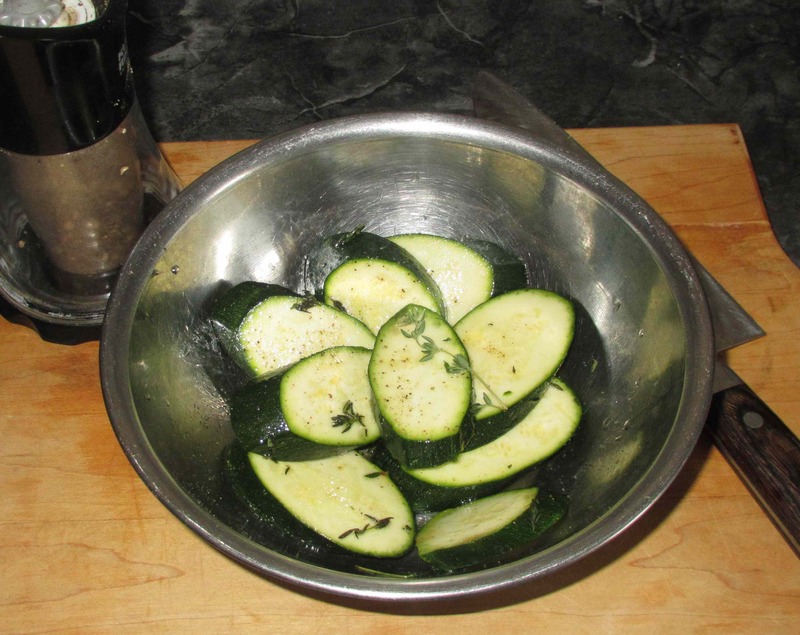 I often grill yellow squash, tater slices and thick slices of sweet onion along side. Like you I start off with a good sear. He likes his medium and I like medium rare. I use charcoal and not gas. Also add mesquite and/or apple wood chips. I have a “high” area of the charcoal and a low area. I move the meat to the low heat area with the veggies and when about ready, move to the high to get that wonderful char. my best bud likes her steaks blue. She gets the meat room temp and then puts it on the high area. counts to 30, turns the steak over and counts to 50. I accuse her of being part werewolf but she is happy. your meal looks great and right now, is making my tummy rumble. We bbq all year long and I have cooked in snow and sleet. although certainly not your kind of snow!!! !